It's a great time for making healthier and more responsible choices about the foods we buy and eat. Farmers' markets and providors are sprouting up everywhere, and even some supermarkets are responding to the demand by selling organic or local produce. By shopping responsibly, you're letting supermarkets and food companies know what consumers want. Here are a few ways to shop responsibly, sustainably and GE-free. 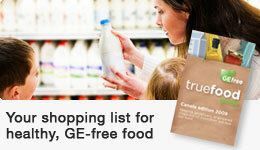 By shopping responsibly, you let supermarkets and food companies know consumers deman GE-free food.